MAR 16, 2017 — Enough is enough! 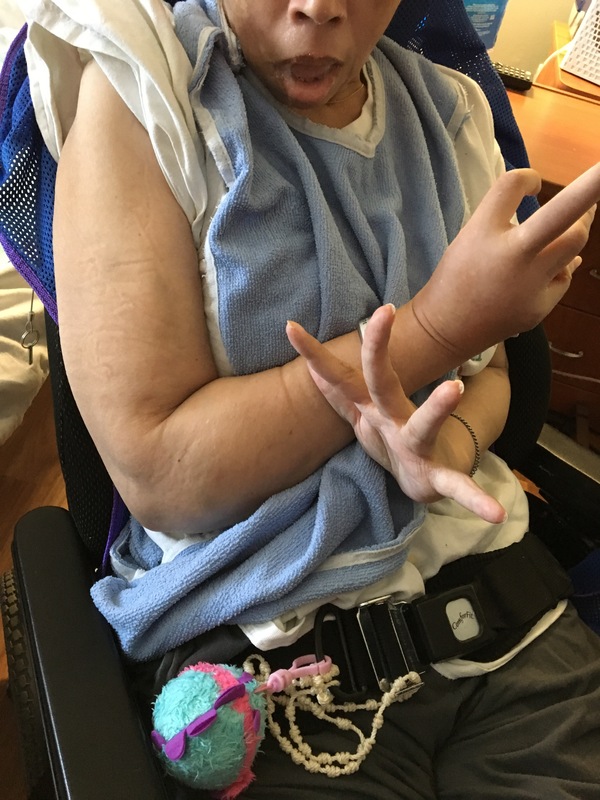 I arrived today to find my sister Anastasia’s right arm and elbow abnormally and grossly swollen and discolored. She is guarding her arm and is in obvious pain. This is the third injury Anastasia has sustained in a week. When she saw me she gave me a look she does not normally make, leaned toward me and started to cry. First the nursing facility and her guardian ignore her eye infection for a week before they finally start an ointment to treat it (which after 3 days does not seem to be working). Next her right knee swells to almost twice its normal size, she can no longer bend her leg, her patella is immobile and the facility and her guardian do not even do an X-ray. Then she sustains bruising under her right eye and right side of her nose as yet again the facility and her guardian do nothing. Now it is her right arm. At this point I have filed a complaint and contacted Adult Protective Services. Her guardian continues to stand by and do nothing to address these issues which is a dereliction of her duty as her guardian and grossly negligent. She has essentially abandoned my sister to be abused and neglected by this facility. By doing so and not acting upon the previous issues and injuries what she has effectively done is tell the facility and its staff they may treat my sister anyway they please because she will believe anything they tell her and will do nothing nor hold them accountable. In essence her inaction has declared open season on my sister. My mom used to say God has a special place and a special punishment for people that mistreat those that cannot protect themselves. I firmly believe this to be true and have been blessed to see it come back around in at least one person who did something to my sister and it wasn’t pretty. God knows just where we live so to speak.